Hamsters have unique, stretchy cheeks that are used to store food and carry bedding. Syrian (golden) hamsters are often studied in research facilities for the unique characteristics of their cheek pouches. A hamster's cheeks are also a place where specific diseases can develop that owners should be aware of. All hamsters have cheek pouches. These large pockets are evaginations of the oral mucosa and can stretch all the way back to a hamster's shoulders. The primary purpose of the pouches is to carry food from place to place. In the wild, hamsters use their cheeks to bring food back to their burrows. This habit led to their name, which roughly translates to "mister saddlebags" in the local Arabic dialect where they are from. Hamsters, like other animals, have two cheeks. Sometimes they stuff both of their cheeks and other times they only stuff one side with food. It is normal for hamsters to carry their food around or back to their beds via their cheeks. They will often continue to eat, even after filling their cheek pouches. Females may even carry or hide their babies in their cheek pouches. Overall, hamster cheeks are arguably the cutest parts of a hamster. A hamster with full cheeks makes you want to grin and cuddle up with your tiny, fluffy, friend. However, this part of the hamster's body is susceptible to a few health concerns. By being aware of the potential problems, you can prevent many future issues with your pet hamster. Cheek pouch abscesses are commonly seen in pet hamsters. These are localized infections that cause pus to build up in the cheek pouch and can spread to the rest of the body quite quickly. This is often treated by an exotic animal vet with antibiotics and sometimes a good cleaning of the cheek pouch. Without treatment, the infection will become painful, causing your hamster to stop eating, and the infection may spread to the rest of the mouth and eventually the bloodstream. When your hamster tries to put something sharp in its mouth. If the hamster nicks its face on something in the cage, causing a small cut or puncture. When an overgrown tooth protrudes into the cheek. Cheek pouch tumors are another common problem in pet hamsters. Tumors are typically cancerous and usually only affect one of the pouches. They can infiltrate the entire cheek pouch tissue which stretches all the way back to their shoulders. Pouch tumors are typically firm and have a different feel than a pouch filled with food. These tumors (usually squamous cell carcinomas) give your hamster a poor prognosis and are difficult, if not impossible, to completely remove while still allowing your hamster to eat normally. Cheek pouch eversion is very rare but it does occur. Eversion is when the cheek pouch flips out of the mouth. You will see a pink bulge in the corner of the mouth, and your hamster may have difficulty eating. Your exotics vet will be able to replace the cheek pouch, but it may need to be stitched back into place if it keeps popping out. Cheek pouch impactions are another rare problem but it is seen on occasion nonetheless. Sometimes large pieces of food and bedding are shoved into your little hamster's cheek pouch, and your hamster can't get them out. If an impaction isn't cleaned out, it will get infected or abscessed when the food or food particles start rotting in the pouch. 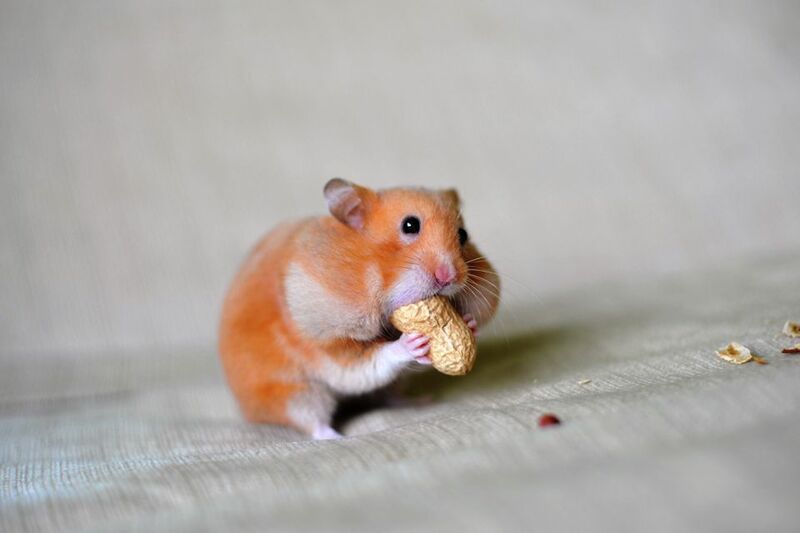 Typically hamsters have no problem moving food in and out of their mouths. However, you should be aware of this issue if your hamster has a large pouch for an extended period of time.